I've had an idea, and I'd like to run it past you if I may and ask for some feedback..
What do you think of monthly pattern clubs? I think I've found a way to do something like this, a way that makes everything very manageable for everyone. Folks would pay a monthly subscription cost and the pattern would be sent out to everyone on the list once a month. To unsubscribe simply miss or cancel a payment. From my end, it's set up like a regular newsletter, only it costs to subscribe. The cost would be something like £2.00 per month and the patterns would be either £2.50 or £3.00 patterns, so a saving would be had. Also, there'd be a period of exclusivity when the pattern would only be available through the Pattern Club, for say 3 or 6 months, after which the pattern would go on general sale and into all the regular channels. It could tie in really nicely with the monthy KALs that we run in the Ravelry group too. It would be a great place for promotions and exclusive and all sorts - there are lots of possibilities! Already I'm starting on building a bank of patterns, so I'd be a few months ahead, as the thought of scheduling patterns and rushing to get one finished in time is stressful. And if it goes ahead, it won't start until later in the year. What do you think? Is this sort of thing normally the reserve of tangibles like yarn and fibre, or could it work for patterns too? 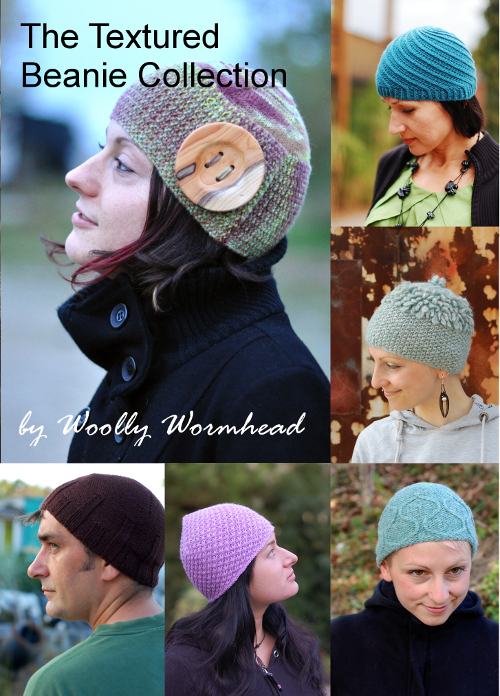 Would Hat patterns be a sufficient draw or would it work better for a designer who creates in a variety of genres? And if you've ever run something like this, could you share the pros and cons? I would love to hear your thoughts - thanks in advance! If you've come over from Twitter, Facebook or Ravelry, can I ask that you leave your feedback here as a comment? Social media is great, yet it can get confusing with everything all over the place, and I wouldn't want to miss your thoughts and suggestions. And onto the bundle business. Another item on the to-do list that keeps getting pushed to the back of the queue is pattern bundles. There are a couple already that I've tried, and I wanted to get another one or two together, to see if it's a viable option. I don't know yet if they'll be a permanent fixture, but when I had a spare hour I thought I'd put another one together and see how it went down. For the bundles, I'm merging all 6 patterns together, with the cover, and setting the output resolution at 150dpi. This is a lower res than the single patterns, which are at 300dpi, yet it needs to be smaller in the bundles to make the file size friendly. The other bundles have now been merged too - previously there were 6 single files but I feel that was a bit messy and difficult to keep track of, so they're all in one now. As I say, I don't know if these will be permanent, but they're worth trying, yes? And why yes, that's very observant of you. Working through all the things at the end of my to-do list does indeed mean I'm clearing the way and getting ready for diving head first into the next big project.... Bambeanies will soon be getting all of my attention.